In separate meetings on Saturday, Iranian President Hassan Rouhani received the credentials of new ambassadors of Germany, Ecuador, Morocco, and Romania, calling for closer ties with the four states. According to a report by IFP, in a meeting with Germany’s new ambassador to Tehran, President Rouhani called for closer interaction in the banking and insurance sectors with Berlin to accelerate development of bilateral relations after implementation of the JCPOA, a comprehensive deal on Tehran’s nuclear program. He hailed the expansion of ties between Tehran and Berlin following the enforcement of the Joint Comprehensive Plan of Action (JCPOA), the nuclear agreement between Iran and the Group 5+1 (Russia, China, the US, Britain, France and Germany). In order to accelerate the trend of mutual cooperation and attain the desirable level, the two countries will need to facilitate and boost ties in the banking and insurance industries, the President added, as reported by Tasnim. Highlighting the opportunities for cooperation in the technical and engineering fields, such as the railroad industry or construction of power plants, President Rouhani stressed the need for strong partnership in the scientific, cultural and academic areas, and in the fight against terrorism. For his part, the new envoy, Michael Klor-Berchtold, voiced Germany’s determination to enhance cooperation with Iran in all fields, particularly in the area of modern technologies. Emphasizing Germany’s commitment to the JCPOA, the ambassador gave an assurance that Berlin will do its utmost to make the other parties honor their commitments to the nuclear deal as well. Rouhani also received the credentials of Ecuador’s newly-appointed ambassador to Tehran, Germán Alejandro Ortega Almeida, while highlighting the common views shared by the two countries on many instances of regional and international issues. “The interference of major powers and the unilateralism approach are among the main factors of instability in various parts of the world,” President Rouhani added, Mehr reported. The Ecuadorian ambassador, for his part, highlighted the extensive commonalities between the two countries in various fields, and called for joint efforts for developing all-out relations between Tehran and Quito. In a meeting with Morocco’s new ambassador to Iran, Hassan Hami, Rouhani called on Tehran and Rabat to utilize the current capacities of the two countries and boost relations in line with the interests of both nations. Development of the ties between Iran and Morocco is in the interests of both nations and the region, President Rouhani said. “We should tap the existing capacities and potentials to expand and strengthen ties and cooperation between the two countries,” he added. The President went on to say that in addition to economic relations, Tehran and Rabat can cooperate in other areas, including culture and science, Tasnim reported. Hami, for his part, said his country always appreciates the Islamic Republic of Iran’s stances on resolution of international problems through dialogue and diplomacy. Hassan Hami was appointed as Morocco’s ambassador to Iran after seven years of severance of diplomatic ties between the two nations. Rabat reopened diplomatic channels with Tehran last year. Morocco’s Foreign Minister Salaheddine Mezouar had expressed his country’s determination in November to appoint an ambassador to Tehran. 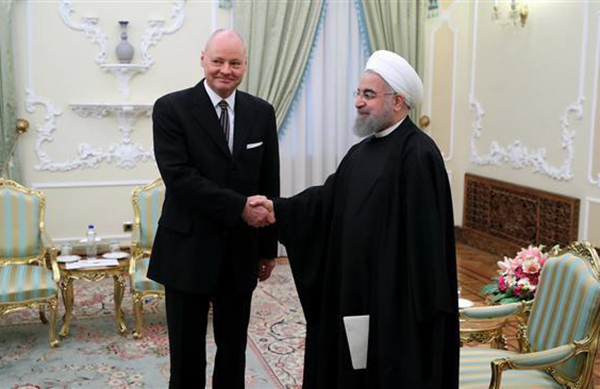 In a meeting with Romania’s new Ambassador to Tehran Adrian Kozjacski, Rouhani said Iran welcomes the expansion of bilateral ties with European Union (EU) member states. “The Islamic Republic welcomes the expansion of cooperation in all areas with the European Union, including with the country of Romania,” he said, as reported by Press TV. There is nothing in the way of the enhancement of mutual relations with Romania, the Iranian president said, adding that the two countries enjoyed many capacities that could be used toward that purpose. Rouhani said, given Iran’s interest in reinforcing the transportation channels leading to and from the country, especially railways, Romania can act as the Islamic Republic’s gateway to Europe via the Black Sea and can in return enjoy more expeditious access to Middle Eastern and Asian markets through Iran. The Iranian president also said that Iran and Romania’s joint economic commission is expected to meet in the future in the Romanian capital of Bucharest. He urged Romania to avail itself of the opportunities that have come about on the back of Iran’s 2015 nuclear agreement with world powers by boosting cooperation with the Islamic Republic in the banking and insurance sectors. Kozjacski, for his part, said Bucharest was determined to expand its relations with Iran in all areas of interest.